Collins Booksellers - 20 Easy Raspberry Pi Projects by Rui Santos & Sara Santos, 9781593278717. Buy this book online. Twenty projects using the Raspberry Pi, a tiny and affordable computer, for beginners looking to make cool things right away. Projects are explained with full-color visuals and simple step-by-step instructions. 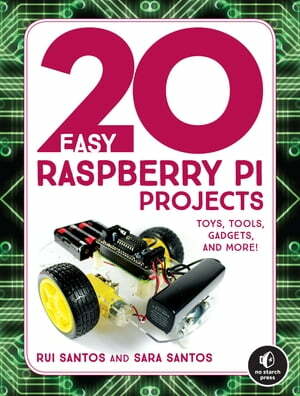 20 Easy Raspberry Pi Projects is a beginner-friendly collection of electronics projects, perfectly suited for kids, parents, educators, and hobbyists looking to level up their hardware skills. After a crash course to get you set up with your Raspberry Pi, you’ll learn how to build interactive projects like a digital drum set; a WiFi controlled robot; a Pong game; an intruder alarm that sends email notifications; a gas leak detector; a weather forecaster; and IoT gadgets that control electronics around the house. Along the way, you’ll work with core components like LCD screens, cameras, sensors, and even learn how to set up your own server. Each project provides step-by-step instructions, full-color photos and circuit diagrams, and the complete code to bring your build to life. If you’re ready to hit the ground running and make something interesting, let 20 Easy Raspberry Pi Projects be your guide.